This website is based on a WWI literature exhibit that was created for the Harold B. Lee Library at Brigham Young University in 1998. This is an updated version of the original site which is archived here. Written by Robert S. Means, English and American Literature Librarian. 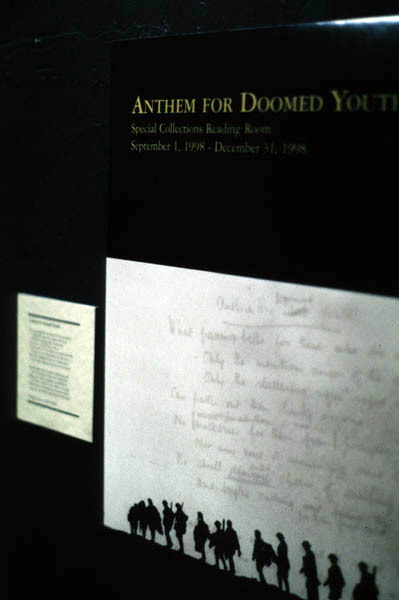 The title, Anthem for Doomed Youth, is based on a poem by Wilfred Owen. On June 28, 1914, Gavrilo Princip, a radical Serbian student, assassinated the Archduke of Austria-Hungary, Francis Ferdinand, and his wife Sophie. This single, amateurish stunt for Serbian independence, coupled with arrogant foreign relations and entangling alliances, would, within a month, draw the western world into the most cruel, catastrophic war it had ever known. 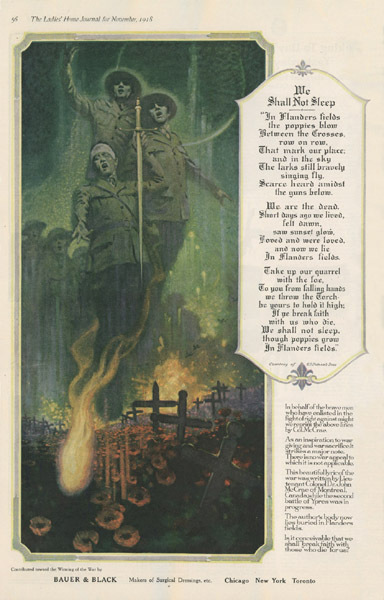 The First World War arrived at the climax of an era of unprecedented growth and achievement in Europe, shattering people's faith in king and country, and putting the lie to the popular notion that man and society had been progressing and improving right in step with the giant strides of the industrial revolution. 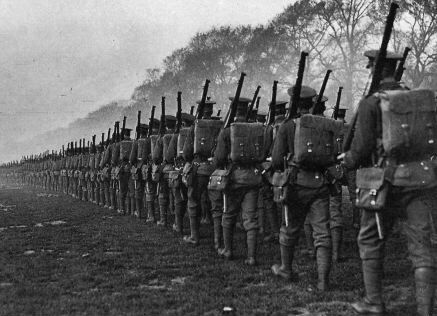 While the world's cavalry polished its boots, prepared chargers and lances, and planned on being home in time for Christmas, all the new mechanical might of modern industry was being massed at the disposal of the Central and Allied Powers -- most of whose leaders had no idea how to use it, or what to expect if they did. In more ways than one, this was a war waged in the laboratory. Four years, and nine million violent deaths and mutilations later, the results of the experiment were in: the war had won. 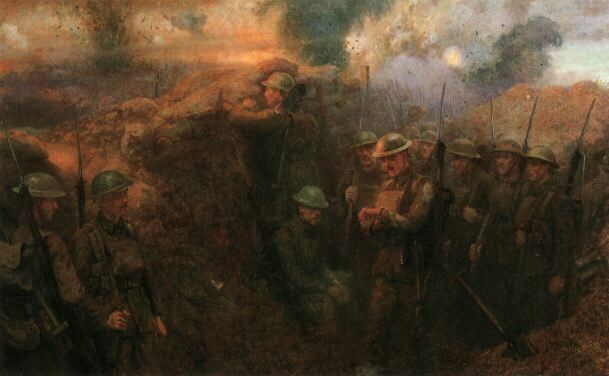 The image is from Edmund Blunden who said, contemplating the first day of the Battle of the Somme, "by the end of the day both sides had seen, in a sad scrawl of broken earth and murdered men, the answer to the question. No road. No thoroughfare. Neither race had won, nor could win, the War. 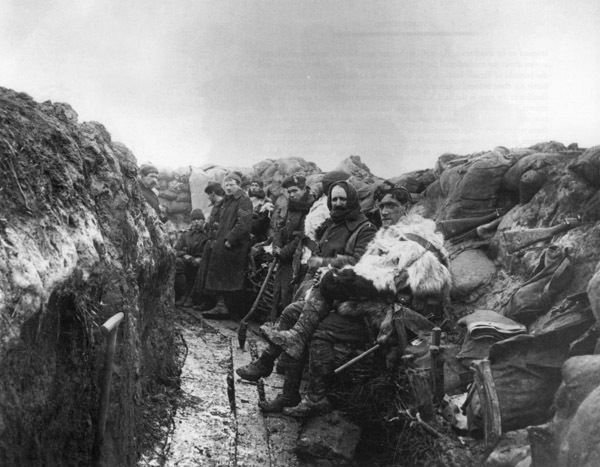 The War had won, and would go on winning" (Fussell, 13). This was total war. This time everyone would be affected: laborers, tradesmen, public school boys, Oxbridge graduates, and women. 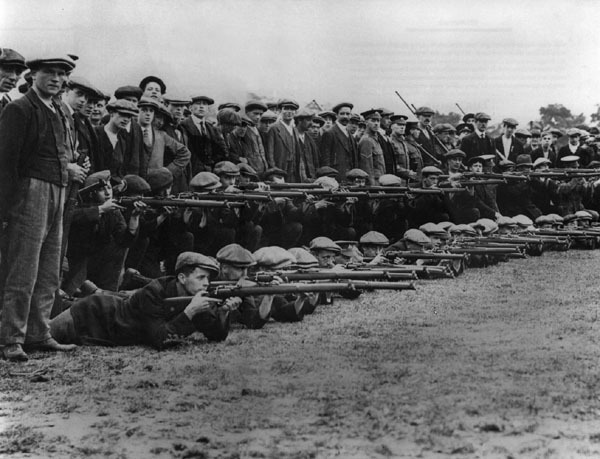 Men from small villages formed up into "Pal's Battalions" only to be wiped out together, leaving their hometowns stunned and empty (see Observe the Sons of Ulster Marching Towards the Somme and War Game). Meanwhile the great men of the day also sent their sons off to the great adventure, only to lose them forever: Rudyard Kipling, Arthur Conan Doyle, and Prime Minster Harold Asquith all lost sons in the war (see My Boy Jack). 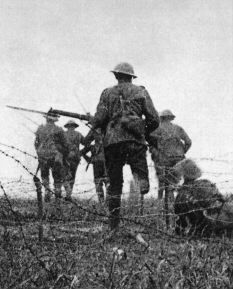 Initially, the war was not called the First World War, for no one could believe that there would ever be another war after this one. It was "the War to End All Wars," "the Great War." 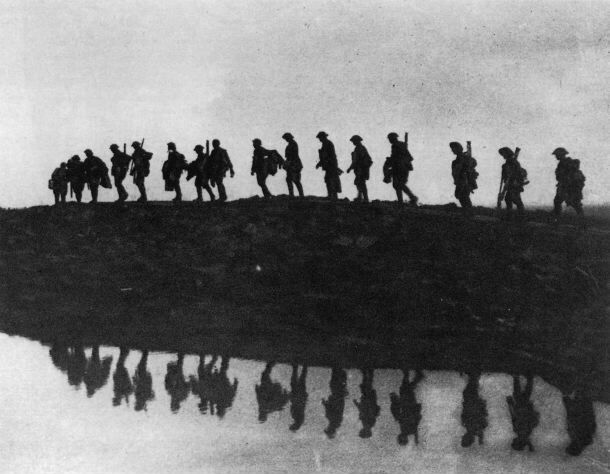 Unfortunately, the Great War became the prototype, ushering in the 20th Century, and establishing the now familiar model of mechanized war and mass suffering that still plagues us at the end of the century. At the end of the Great War, what seemed to be a restoration of peace and the balance of power, in fact bred a legacy of bitterness between the former enemies that eventually lead to an even worse Second World War only twenty years later. The Great War was a fissure that wrecked forever the continuity of progress, and changed everything in the West: in addition to nine million lives extinguished, the war exhausted treasuries and bankrupted both winners and losers; in the war's climate of suffering and despair, revolutions toppled venerable monarchies and brought Communism to Russia, and Nazism to Germany. Even the arts would never be the same. As Philip Larkin wrote, "Never such innocence again." The world before 1914 spoke a different, decidedly old-fashioned language (see Paul Fussell's "Table of Equivalents" in his book The Great War and Modern Memory) born of their Victorian/Edwardian upbringing. This earnest innocence, or fated naivete if you wish, was both their curse (see Keith Douglas' poem "Sportsmen" and a snippet on Englishmen from Wyndham Lewis' BLAST), and their cachet (see Song of Tiadatha). 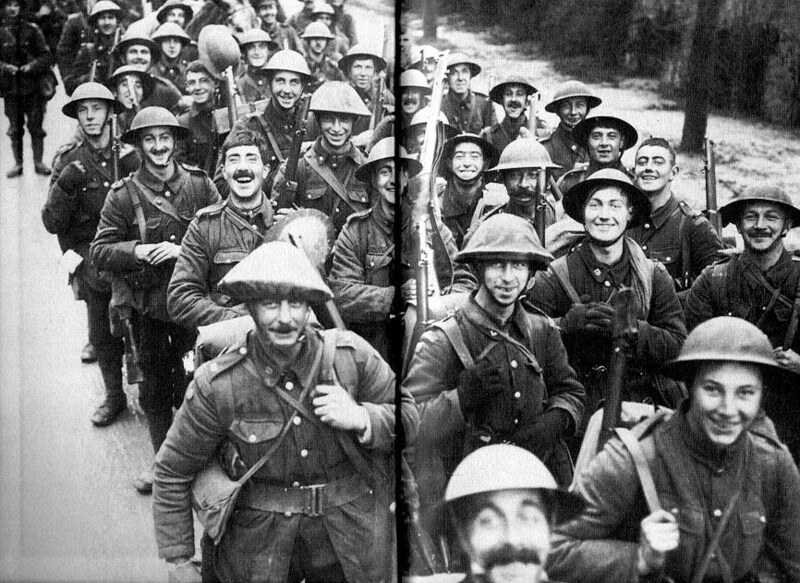 For the generation who fought it, the Great War was at once their defining moment and their worst disaster. As Siegfried Sassoon said "to me, the War was inevitable and justifiable. Courage remained a virtue. And that exploitation of courage, if I may be allowed to say a thing so obvious, was the essential tragedy of the War, which, as everyone now agrees, was a crime against humanity." To maintain a manageable scope, this exhibit does not include a detailed history of the war, nor is it meant to be an in-depth critical study of Great War literature (to access the exhibit's historical and background materials, please click here). The exhibit focuses on writers and literature of the war. The writers are mainly British junior officers. Many major poets (Edmund Blunden, for example) are under represented, while many lesser-known poets (for example, Ewart Alan Mackintosh) have been included and even highlighted. Ultimately, this is an exhibit of the Harold B. Lee Library's collection of Great War literature, and one sentimentally and idiosyncratically arranged to suit one man's ignorant self-indulgence. I'd like to thank Scott Duvall, Chair of Special Collections, and his staff and students for their help and support. Robert Espinosa, Scott Eldredge, and the staff of the Imaging Center -- especially Jared Ottley who created the Web-page for the virtual tour (which includes many items, photos, and added explanations for which there weren't room in the physical exhibit), and Galen Montague who designed the exhibit posters. Roy Daniel made the AV portion work. And Randy Olsen came through with the money. An additional word about acknowledgments. This site has been constructed with no financial purpose, or ulterior motive whatsoever, but only to preserve the experience of the physical exhibit and the memory of Armistice. 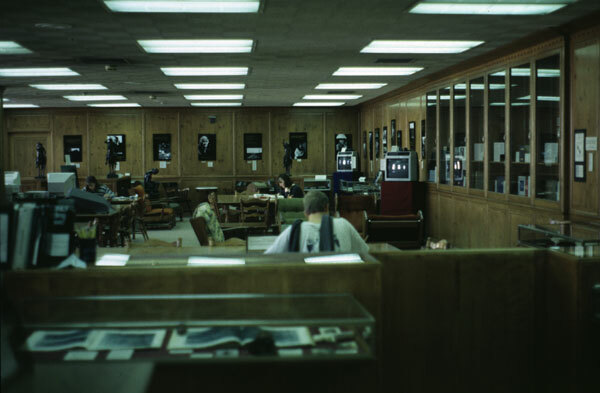 The virtual exhibit is free to anyone who wants to browse it, just as it was when it existed as a physical exhibit in the Lee Library. The materials are all owned by the Lee Library (with the exception of a few items, so noted, that have been freely loaned to the exhibit). The reproduced photographs are all from books owned by the library (with some few exceptions as already mentioned above), and every attempt has been made to attribute them to the books in which they were published, and (if possible) to the collections or archives which hold the original. I offer them in this virtual exhibit, just as I did in the physical exhibit, to illustrate and enhance the visitor's understanding of the war and the literature written by its participants, and denounce any attempt to use these images for commercial gain without first having obtained written permission from the collection which holds the original. This site is copyrighted by Brigham Young University, which offers these materials from its collection to its patrons, free of charge, for personal education and enrichment.